Many of Paula’s commissioners have discovered her work through visiting the Bromley by Bow Centre. Paula’s work adorns the grounds of this community centre and her studio is one of the highlights of a centre tour. 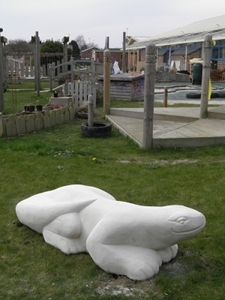 This was the case with Candy Daffern, head of the Chichester Nursery and Children’s Centre who in October 2010 commissioned four large sculptures. The creatures quite literally came out of the amorphous rock selected by Paula. The size, shape and textures of the Bath Limestone used dictated the creative direction Paula took. Paula first selects the stone by personally visiting the quarry. 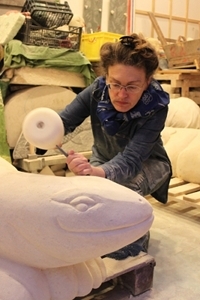 For these sculptures, she sourced from the Bath Stone Group, Stoke Hill Mine at Limpley Stoke, Bath. 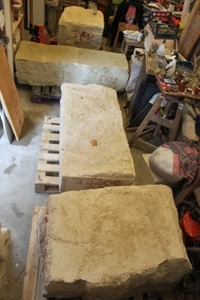 The particular stone chosen was Stoke Ground Top Bed. After some sketching and research, a Rabbit, Lizard, Pecking Bird and Bear were arrived at as perfect companions. 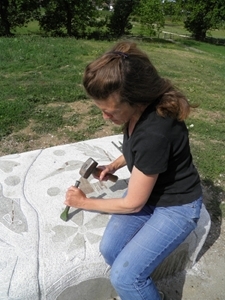 Paula paints the line drawing of the creatures onto the rock and begins to sculpt. These four creatures, each weighing nearly a tonne, took just over 4 months to sculpt. 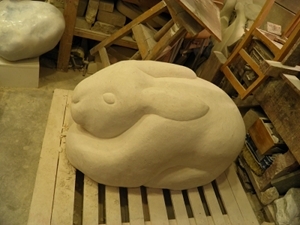 In February 2011 much of the rough carving had been done and each creature underwent a smoothing process. 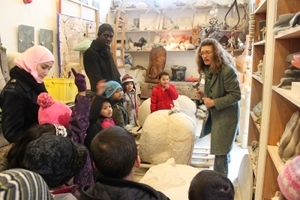 During the sculpting process two groups of children from the local Old Palace Primary School paid her a visit. They studied her works in the park and then came into the studio to learn about the process and see the tools and techniques involved in carving. The final installation presented quite a challenge in terms of installation. The sheer weight of each piece meant careful transportation and manoeuvring were essential. These works finally went in on Saturday 12th March and met with popular acclaim. They are friendly creatures that will stimulate imaginative play for many years to come. 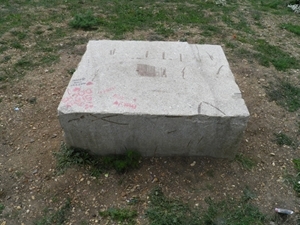 With the Beam Parkland commission, the piece of granite lay at the wetland site in outer Dagenham – a piece of rock abandoned after some river work. 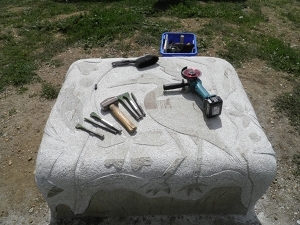 The tools for sculpting granite. 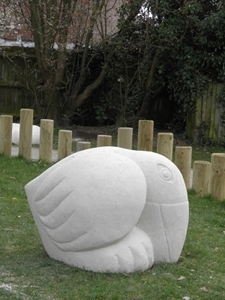 Situated between housing estates, this site has been designated a new area of natural beauty and Paula worked on site, carving from the site-specific symbols of creatures and plant-life. She also incorporated spots on the surface to mark the memory of the smallpox hospital that once stood on this remote spot. 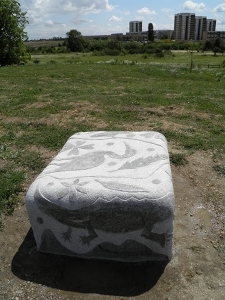 This July 2011 sculpture seat captures Paula’s strength in relief-work, which is to study the history of a place and bring it out in pictorial clues on the surface of the rock. 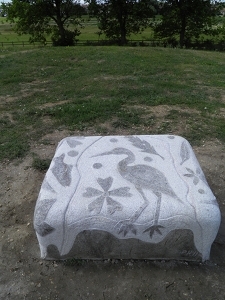 Alternative view of the finished sculpture seat with the crested newt carving shown.